An archaeological mystery that has eluded experts in Kent for 140 years has finally been solved following the rediscovery of the site of a Roman villa. The remains of a bath house were first unearthed in hop gardens on the banks of the River Medway at Teston in 1872, but after some excavations it was covered over until 1972, when archaeologists reinvestigated the site but failed to locate any trace of ancient remains. Nearly 20 years later, in 1991 during the emergency renewal of a sewer, Southern Water uncovered Roman building materials and pottery, with archaeologists subsequently revealing the remains of a Roman masonry building. Parts of a possible corridor or portico, a courtyard and at least one tiled floor were uncovered and the route of the pipeline was diverted to protect the discovery. However, it was only last year, after a a geophysical survey identified possible masonry walls, that the owner of the site invited the Kent Archaeological Field School to undertake further investigations in the search for the bath house originally discovered in the 19th Century. Earlier this year, a team of archaeologists dug tests pits and rediscovered the villa. 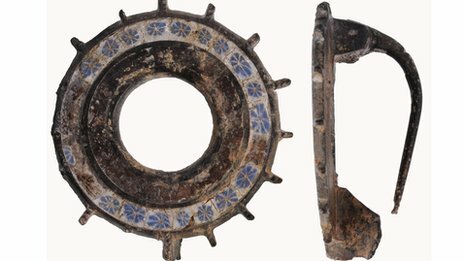 Dr Paul Wilkinson, director of the Swale and Thames Survey Company (SWAT) Archaeology, said the location of the 1872 discovery was identified and found in the north-west area of the villa. Rooms with under-floor heating, a 127ft (39m) wall with substantial towers or pavilions at each end, marble from a mosaic pavement, painted plaster and window glass were among the remains uncovered.